One of the parts of Sweet Escape 2013 that I was most excited about, was the Bonfire and DIY S'Mores Bar Event that I planned for Friday night. I'd always dreamed about having a lavish s'mores themed party where my guests could choose from a bountiful array of marshmallows, chocolates, cookies, and toppings to create their own unique combinations. Life in an apartment makes this a bit tough (lack o' fire), so I knew I had to make this happen at Sweet Escape. I was so honored to have two sponsors who made this possible for me with their generous product donations. 240 Sweet, an artisan marshmallow maker based in Chicago provided an assortment of some of their incredible marshmallow flavors including vanilla-sriracha, coffee chip, honey & pink peppercorn, avocado & lime, elephant ear, and SO many others. Green & Black's sent us an assortment of their delicious organic and free trade chocolate bars in incredible varieties like dark 70%, chocolate mint, milk chocolate, toffee, chocolate almond, ginger, creamy white, and spiced chile. The bars were such a hit and people were debating over their favorite flavor (mint seemed to be a big winner). In addition to classic graham crackers, I put out cinnamon grahams, ginger snaps (my favorite! ), buttery shortbread cookies, chocolate chip cookies, and dark chocolate-covered pretzels to sandwich the marshmallow and chocolate. For filling, I included some chocolate nut butters, jelly, and Nutella to spread on the crackers. I also added fresh ripe blueberries and strawberries, as well as some wrapped caramels and (since we were in Vermont!) maple candy wafers. I love savory elements in my desserts, so I added a log of soft and creamy Vermont Creamery goat cheese, some dried culinary lavender buds, and fresh mint leaves. I also included a jar of thick and syrupy balsamic vinegar glaze. To drink, I put out a couple bottles of chilled RumChata--a sweet rum and horchata cream liqueur that was the perfect accompaniment on its own and poured into coffee. I also included a little cutting board and knife for cutting the big puffs into smaller pieces. And for toasting, we lit a gorgeous crackling fire in the bonfire pit outside. The attendees freaked out a bit when they saw the display, which is exactly the reaction I was hoping for. 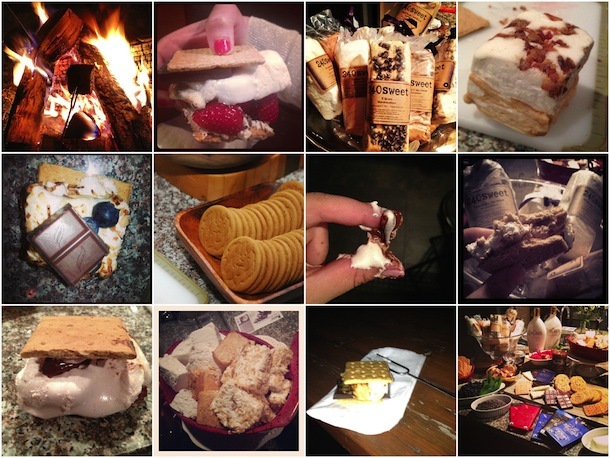 After attacking it with their cameras (check out the hashtag #sweetescape2013 on Instagram and Twitter), they got to work creating some pretty incredible s'mores combinations. I saw everything from toasted coconut & blueberry with the Green & Black's chocolate almond bars, to strawberry marshmallows with dark chocolate, goat cheese and balsamic to bacon with peanut butter, white chocolate, and maple. Such a perfect ending to a lovely summer day! Click here to read more about my Sweet Escape Retreat Weekend. And email me if you'd like to get on the list for next year's event!